Trevor Kallies, of the Donnelly Group. Some of the hardest work I’ve ever done. And those Canucks know their way around a shot glass. Don’t remember much, but in glancing though my drunken photos I vaguely remember thinking that this bar just hit the nail on the head. 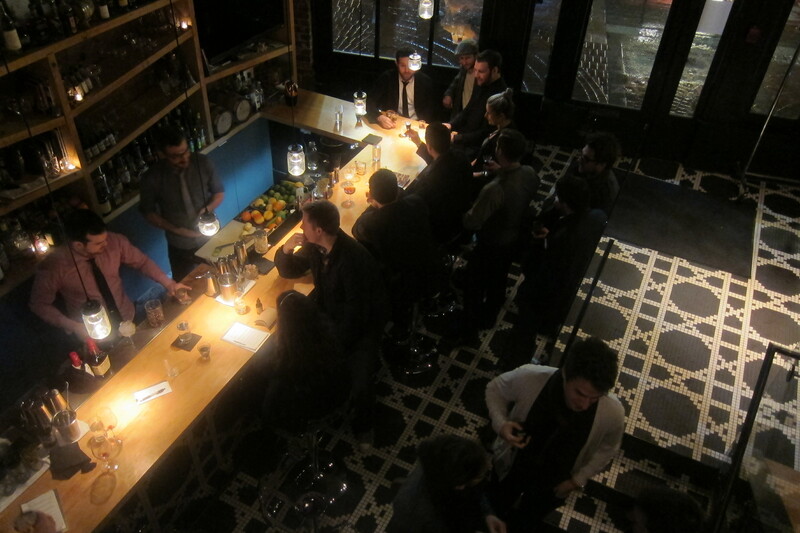 L’Abattoir http://www.labattoir.ca/ hits the right mix of swank and sass. There’s a sleekness and a touch of old-world pride, but it’s somehow thrust off-kilter in a way that feels young– check out the crooked shelving on the back bar and the tiles that lie somewhere between Art Deco and Humane Genome. It wasn’t until I saw the photos that I realized… Shaun Layton’s Meat Hook cocktail had me sure those shelves were on straight. A dark, bittersweet, smoky concoction, it’s also got a certain touch of New-World pluck. Thanks for the memories, Vancouver.